I brought my Betty Crocker cookbook on my honeymoon (over forty years ago), and studied the spices and herbs list, and the best seasonings to use for various foods. Forty two years later- guess what? Betty proved right! 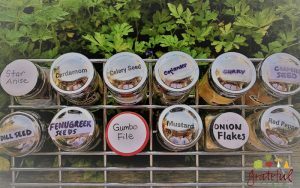 But I’ve added a few favorite applications for various herbs and spices myself, and have listed it all below. 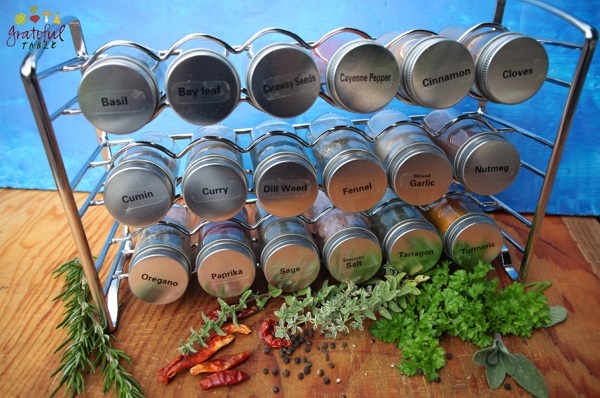 Enjoy exploring the exciting world of spices and herbs. Of course, a garden of fresh herbs can’t be beat. A list of favorite fresh garden herbs is at the bottom of the page. Basil- So good with tomatoes. You knew that, right? It can give dishes a little Italian flavor. Good with meats too. Bay Leaf- Throw it into the pot when making soups. Adds an extra flavor. Keeps things exciting. Cinnamon- Get Ceylon cinnamon (It’s the best. And good for you.) Great in baked goods, or in a hot drink, like this Golden Milk. Cumin- Make it Mexican-style. Add to beans, meats, chili, whatever. Dill Weed- This is one of the distinctive flavors in our ever-popular, MSG-free New Deli Ranch dressing. It’s also good in tomato soups, with cucumbers, in bread. Nutmeg- A warm flavor, somehow. Makes my tummy happy. Especially in this Rice Pudding. Or add it to other warm drinks, or creamy sauces. We put it in our Chicken Alfredo at The New Deli. Oregano- Spells Pizza. Yum. Or add it to other tomato dishes, or fresh salads. Or meats. Ya know, just about anything! I love the 1000 Island Dressing we make, that we put this in. Paprika- I love how it brightens up so many dishes, giving them extra color. And flavor, of course. But also- it’s a way to get some extra antioxidants in. Paprika’s loaded with ’em. But it comes from red peppers, which are on the dirty dozen list. Which is why I get this organic paprika. I also have this organic smoked paprika on hand. And it is DEFinitely smoky! Sage- Seems like a “deep” herb that warms my tummy. Good with chicken, of course, or in soups, and other meats. We put it in our Meatloaf Mix. Tarragon- This is good in the usual (meats, poultry, soups, salads), but it’s good in fish too. We put it in our Italian dressing at the deli. Caraway Seeds- I love to add these to my raisin walnut bread. Good in sauces and sauerkraut. And Chicken Paprikosh! Coriander- I used to think I didn’t like this stuff. But it adds an almost magical depth to the deli’s Cauliflower Soup. So good! Gumbo File- Made from sassafras leaves. It adds that extra something to Gumbo. Cardamom- Adds a bit of Indian or African flavor to the meal. Add to curries too. Cloves- Spicy goodness to zip up dishes. Cumin Seed- We toast these and add to The New Deli’s Black Bean Chili. Yum. 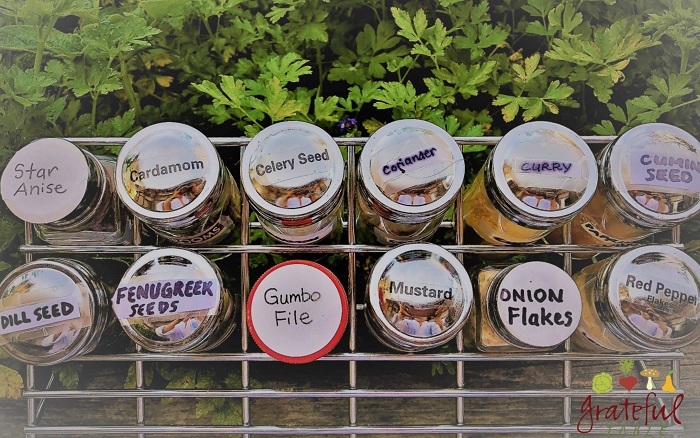 Dill seed- A more intense dill flavor. Doesn’t discolor like dill weed can. But still good added to bread. Like this “Dilly Casserole Bread“. Fennel- Use it in a Chinese 5-spice powder along with cloves, cinnamon, peppercorns, and star anise. Fenugreek Seeds- Make a homemade curry mix with this. Incredible maple smell to this stuff. Wild. Toast gently in a hot pan to bring out the flavor, then grind in a coffee/spice grinder. Garlic- This doesn’t really have to be on the list, since fresh garlic is so so good. But… what if you were out of fresh?! Mustard Powder- Every now and then, this comes in handy. Good in homemade mayo. Onion Flakes- We use this in our meatloaf mix too. The texture’s good- it adds the flavor, without adding an overpowering presence of fresh chopped onions. Red Pepper Flakes- Spice up a sauce. So pretty floating in the sauce for these Vegetarian Spring Rolls. Saffron- You can make an amazing paella with this stuff. Such a unique taste. To maximize flavor, let a few threads soak in boiling water for several hours first. Some of these may grow for you, some may not. The herbs below are worth trying though. Parsley- I’ve practically got a field of parsley now, after having no luck the first few years. Trick was to let one of those first plants go to seed. Then I lay the seed-laden plant in a little pile (with the decaying plant covering it, to protect it from the birds). Come spring, new little seedlings pop up all over. Sage- Grows easily enough. Some varieties are quite hardy. Rosemary- Grows like a weed. If you don’t have a green thumb, plant rosemary and relax. I don’t think you can kill it. Oregano- This is a pretty hardy plant. Should grow well! Basil- Mine never thrives. But then we live very close to the coast, with a constant cool breeze. Basil loves the heat. And water. Don’t forget to water. Cilantro- You may do well growing cilantro, but it often will not sprout from the cooking seeds found in the grocery store. I found out they irradiate them (or something…). So get them from a seed packet, or maybe a reputable health food store.